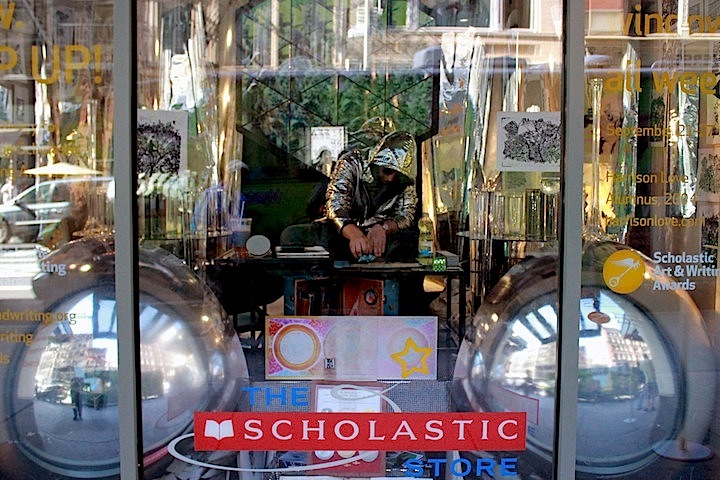 Celebrating the launch of the 2015 Scholastic Art & Writing Awards, Scholastic is hosting a pop-up art studio, titled Art.Write.Now.POP-UP!, in its Scholastic Headquarters Window at 557 Broadway in SoHo. Harrison Love, an award-winning artist, is creating live art daily from 10:00 a.m. – 5:00 p.m. through Friday. We stopped by yesterday afternoon and had the opportunity to pose a few questions to Harrison. How did you team up with Scholastic? In 2004, when I was a senior in high school in Connecticut, some artwork that I had created was submitted to a contest sponsored by Scholastic. I then received an invitation to a Scholastic event where I received five awards. It was amazing! 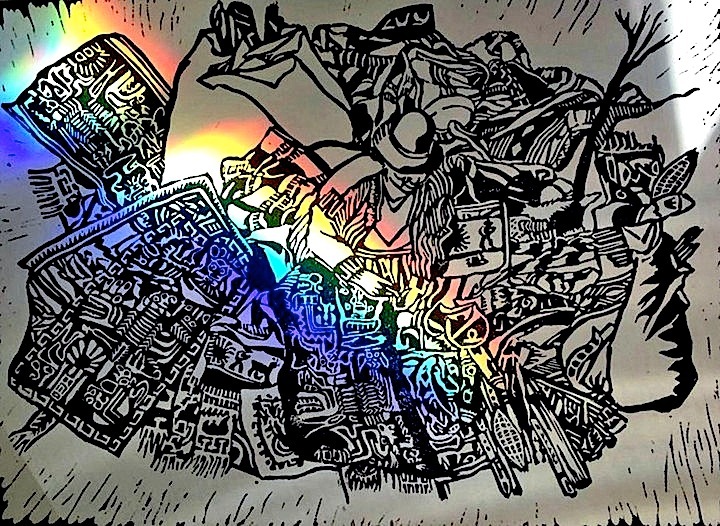 It gave me the encouragement I needed to continue to be creative and to establish a career as a visual artist. Scholastic also continues to give me a sense of community. And as so many of us artists tend to be loners, this is something that we need. What is it like for you — 10 years later — to be painting in such a public space as a window in SoHo on a street as busy as Broadway? It is very interesting. I like it! It gives me an opportunity to communicate with people without talking! 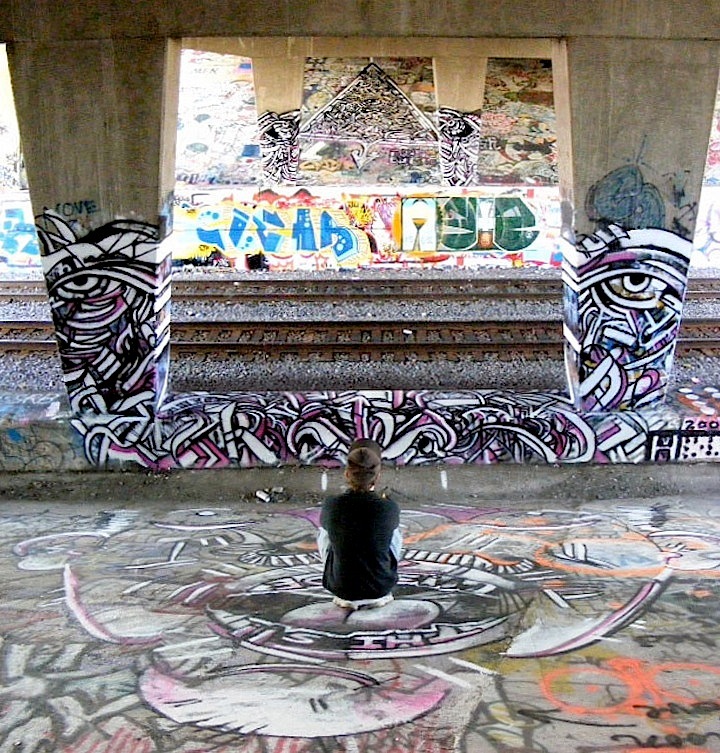 Have you ever painted in public before? Not quite like this! But I’ve done live painting in a few cities including San Francisco. What inspired you to create these particular pieces that you are working on now? They are prints for an upcoming book that is based on my travels to the Peruvian Amazon. One of my artworks was recently acquired by the San Francisco Museum of Modern Art (SFMOMA). I’m looking forward to getting my art out in many more settings both here and in my travels abroad. 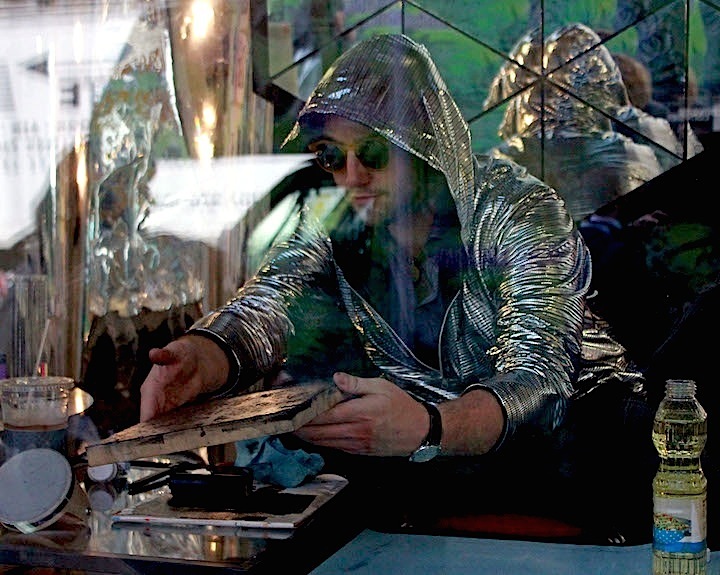 Note: Triangle mirrors, prisms, mylar and glass structures fabricated by Colin Bowring, the Art Science Wizard. Interview conducted by City-as-School intern Tyler Dean Flores; photos 1 and 3 by Tyler Dean Flores, 2 and 4 courtesy of the artist. Educators and students interested in the 2015 Scholastic Art & Writing Awards can register here.